We've moved from www.learningtoeatbook.com to www.learningtoeat.com. Please update your feeds & links and enjoy the new site! This side dish/appetizer is so easy that it would be dumb–if it weren’t so cute. It came about one day last spring, when I was looking for a really fast, mess-free, new way to serve the fresh tomatoes the kids eat every day when they’re in season. Marginally decent tomatoes are just beginning to make their way into our market, so the Tomato Surprise has made it’s way back to our dinner table. The idea is simple: sprinkle a little salt in a small, shallow dish, pour in about a tablespoon of olive oil and splash or two of balsamic vinegar. Cut a tomato in half, then in quarters, then put one half the tomato in the dish (you can see how this is a snap for 2 kids). Tuck a basil leaf (or mint, or cilantro, something fresh and spare-looking) and serve. The “surprise” is that the dressing is under the tomato. For some reason, my kids think this is one of the best things ever. They eat it nearly every day as a quick appetizer, or sometimes even for snack or lunch. I like it because it’s neat and, obviously, healthy. The food looks like what it is, but with a little flair. As I’ve suggested before, when it comes to food, looks matter. 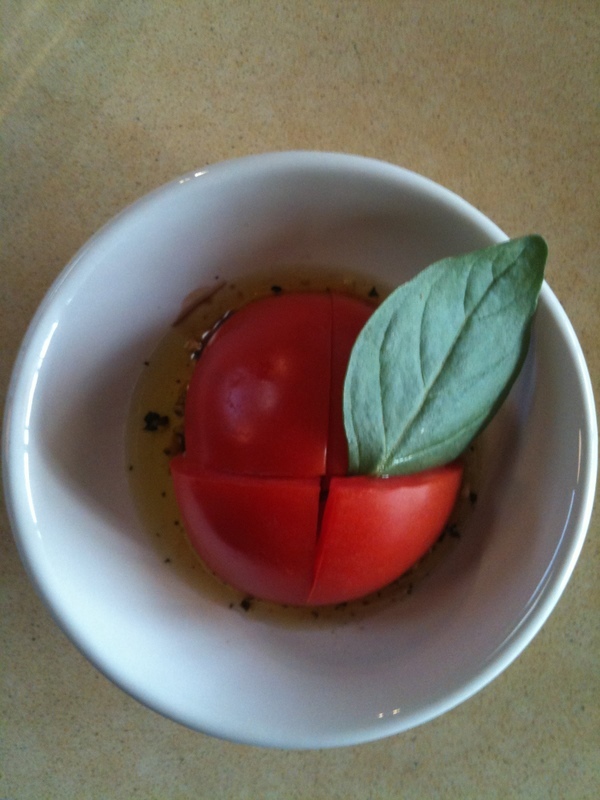 If you like, you can experiment and make an inverted caprese by putting a thin, quartered layer of mozzarella under the tomato. Food & Farm Film Fest! The Second Annual Food & Farm Film Fest is coming to San Francisco’s Roxie Theater; check out the amazing line-up here, including a short film about siracha, a feature-length documentary about honeybees, and a festival-closing program of three films on chocolate and coffee. Each screening is accompanied by a great-looking menu. Californians: Does your child’s school serve a particularly good lunch? Take a picture and enter this contest hosted by The California Farm to School Network. Follow this link for complete details on how to enter. April 21, 2017 No articles on this date.